Wow! Wednesdays seem to come around fast! It is already time to do another "Whatever Wednesday" post! So, for those of you who may not know what I am talking about, I have chosen to take some time on Wednesdays to focus on the many blessings I have in my life. I am following the advice of a verse found in Philippians 4:8, " Finally, brothers, whatever is true, whatever is noble, whatever is right, whatever is pure, whatever is lovely, whatever is admirable - if anything is excellent or praiseworthy- think about such things.". It isn't very hard to think of good things as I sit in my warm house on a cold, wet day drinking a hot french vanilla cappuccino. I can think of many small, ordinary things that happened this week that were good and true, and lovely even. Today, though, I want to focus on something that is excellent and praiseworthy! How often do those types of things happen to us? Not enough - so when a miracle shows up it is only right to sit back and fully appreciate the God who made it happen. I had the honor to spend some time with Michael's mom today. Michael and his parents started to attend our church very shortly after we moved here. They had been to our church just twice when he was diagnosed with a brain tumor. Michael is just two years old. They were told, at first, that the brain tumor was benign and we were all so excited and relieved. After two months he started to display some more symptoms and more tests were done. It was not good news this time. The tumor was aggressive and malignant. His parents were told that the tumor was inoperable and resistant to chemotherapy. He was given a 10% chance to survive. They were told that he may not make it to the second round of chemo. It did not look good. Michael has undergone two rounds of chemo now and just went in for an MRI yesterday. His parents are to go in tomorrow for a report on the tumor and he will start his third round of chemo. Stephanie and I met for lunch today and as we were waiting for our table her phone rang. It was one of those moments when time seemed to stand still as I watched her scream "NO!" into the phone and crumple into tears. I stood there thinking the worst and trying to figure out what I should do when she turned to smile and say, "The tumor is shrinking!"! We stood in the lobby of Eat-n-Park and hugged and cried as people stopped to stare and some even cried along with us. It was an excellent and praiseworthy moment! And Stephanie did praise God. Right there in front of everyone with no shame. We did go into the restaurant and eat then. We sat and talked about life. We laughed. We shared our fears and our mistakes. We shared our stories. We shared ourselves. I was able to tell her how proud I am of how she is handling this crisis and how I can see her growing through it all. I look at her and I see myself. I was just two years older than her when our Emma was born and I was faced with loss head on. I realize how young I was. How young she is. So much for a young person to handle and she is doing it with grace and beauty. We sat and listened to each other. A difference in age, maybe, but equals. Friends. As we sat there, I experienced another one of those miraculous moments that only come every so often. One of those moments to savor. I had a moment when I knew, without one doubt, that I am exactly where I am supposed to be doing exactly what I am supposed to do. So many times I question myself, my decisions, my purpose. But, in that moment, I felt clarity. I saw the big picture. 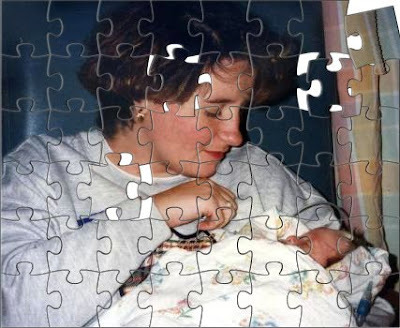 Like the pieces of a puzzle, the pieces of my life were coming together to form a picture! A God-given, excellent, and praiseworthy picture! You seem to be WHERE you are because of WHO you are and WHERE you have BEEN. Not the WHY's. Not the HOW's or the WHEN's. This is for God to know. I reflect on the 29 years since we lost Katrina. Time is irrelevent.